Hermiston’s Josh Galvez contests a header with Hanford’s Evan Smith in the Bulldogs’ 2-1 win against the Falcons on Tuesday in Hermiston. Hermiston’s Che Cadenas dribbles the ball ahead of Hanford’s Jarod Marshel in the Bulldogs’ 2-1 win against the Falcons on Tuesday. Hermiston’s Moises Lopez attempts to steal the ball from Hanford’s Evan Smith in the Bulldogs’ 2-1 win against the Falcons on Tuesday in Hermiston. The Hermiston boys like to keep their audience in suspense. The soccer team made its Mid-Columbia Conference debut April 2 at home against Hanford. The Falcons took an early lead, but Hermiston came back to tie it up just before halftime, and finally pulled away for a 2-1 victory. Those expectations weren’t unjustified — the Falcons were without a single win all the way through the preseason (0-6). Meanwhile, the Bulldogs were going in with a 1-4 overall record. 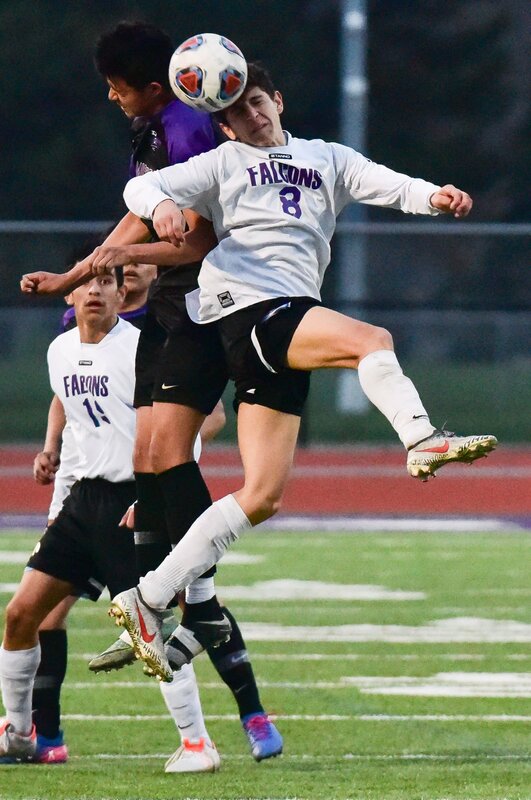 But the Falcons got off to a hot start when freshman midfielder Ethan Henning kicked a goal in not 8 minutes into the game. They would hold the 1-0 advantage for 24 minutes until Bulldog junior midfielder Coleman Solano assisted sophomore forward Moises Lopez for a goal to knot the score. With the score tied at 1-1 at the half, Harshberger knew something had to change. At 18:39 in the second half, senior midfielder Emilio Leal drove the ball down the field, gearing up to put a goal in, but soon found himself cornered by a Hanford defender. He eyed an opening and passed the ball to Alexis Leal, who kicked in an easy goal to push the Bulldogs out front. Alexis Leal finished the night with three shots off goal, and only one on. Senior goalie Juan Navarrete recorded two saves. HERMISTON 8, SOUTHRIDGE 0 — The Bulldogs started scoring goals just three minutes into their home game Friday against the Suns and never let up for their second Mid-Columbia Conference victory of the season. Josue Cadenas scored two goals for Hermiston (3-4 overall, 2-0 MCC), and Emilio Leal, Josh Galvez, Gerardo Sotelo, Yovani Razon, and Moises Lopez each put one in, as well. Matt Mendez put an own-goal into play for Southridge to finish off the scoring. The Suns recorded just four shots-on-goal for the night, but couldn’t get one in past Hermiston’s goalkeepers.